In the midst of calm, sleepy hills of Kandy one cannot expect much of night life unlike in the commercial city of Colombo. The year 2018 ended making a difference to this atmosphere where the musical vibes caught all those who flocked at The Grand Kandyan, a much sought after hotel in Kandy to welcomed the year 2019 with much excitement. Locals and foreigners at the hotel were grooving to music till the dawn of the New Year. 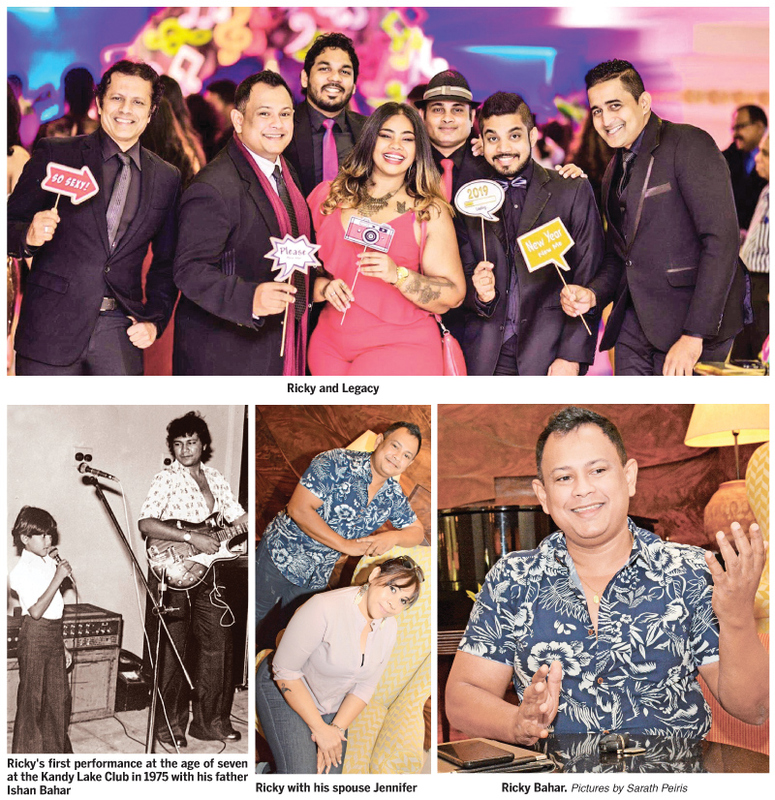 Entertaining a crowd for long hours is not an easy task but it was not so for the popular band Legacy led by equally popular and talented singer Ricky Bahar. The band created special sounds on New Year’s Eve with the bassist Timal Jayamanne who has more than two decades of experience in music industry and the managing partner of Legacy, Manoj Ramanayake on the keyboard, guitarist Sugath Sumodha, drummer Dilshan Jayatilleke and Nayaomi Wijemanne whose smooth vocals kept the crowds glued to their performance. Spear headed by Ricky Bahar from the band `Steelers’ who rocked the Sri Lankan Western music scene from the 80s to the late 90s till they migrated to Europe, Ricky and Legacy will definitely rock Sri Lanka’s music scene for many more years. “It was an awesome night at Grand Kandyan and I thank its Chairman Thusith Samaraweera for having us. It has been a long journey for me from the time I was with `Steelers’. We had our moments here in Sri Lanka rocking the country’s western music scene from the 80s to the 90s and then later we toured Europe, the USA, Sydney, Melbourne, Brisbane, Dubai, Thailand, China, the Maldives and five states of India including Mumbai and Goa,” says Ricky Bahar who completes 30 years in Sri Lanka’s Western music industry this October. A professional entertainer and singer of international standard and coming from the legendary Bahar family, Ricky performs for a countless number of top corporate functions and dinner dances and weddings in Sri Lanka and for audiences in the USA, Australia (Sydney, Melbourne and Brisbane), Dubai, China, Thailand, Europe, Maldives and over five states in India including the vibrant entertainment hubs Mumbai and Goa. “My father, Ishan Bahar, was well known in the Sri Lankan music industry as he performed with Jetliners, a beat group that revolutionized the music scene but he never encouraged us to take up music as a career,” says Ricky. Ricky the eldest in Bahar family, with his brothers Shane and Mario, was the only one who took up music professionally following his father’s footsteps. 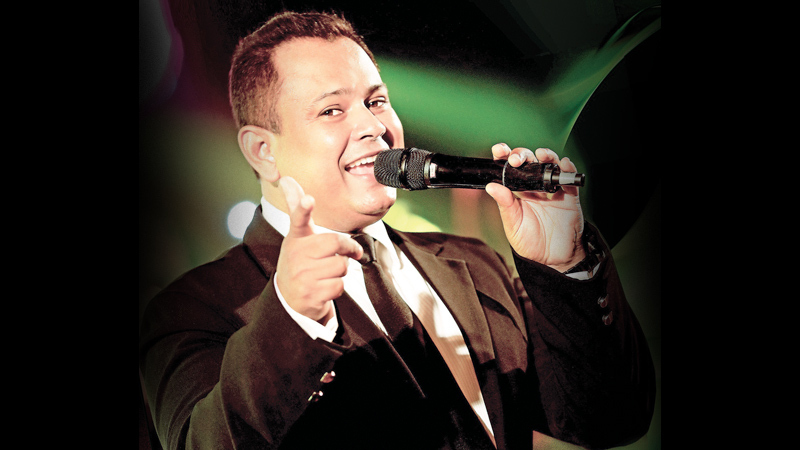 His first gig was at Kandy Lake Club when he performed with his father at the age of seven. “My father being involved so much in the music field was an excellent launching pad for me but at the same time it was challenging. To deliver a performance that meets the standards of Bahar family’s music was no easy task. It pushed me beyond my limits to deliver an excellent performance to the audience. I am glad that I have been successful at every function and have come this far as a professional singer and entertainer,” Ricky said. Not limiting his career to entertaining, Ricky has worked for Emirates Airlines for several years handling its Corporate Communications and all entertainment aspects of the airline. “Right throughout, I have been involved in a career parallel to being a professional singer and entertainer. It has being extremely hard and I have tried my level best to meet the standards and expectations of my clients as well as my employers. I am a teetotaler and I believe that was the key to my success. Breaking rest and entertaining crowds sometimes till dawn I was able to take a quick rest and go back to work,” mused Ricky. Whist winning many national awards which includes the prestigious `Observer Golden Clef award’ for Best Male Vocalist consecutively for many years for his rich vocal ability, range, versatility and professionalism, he was also recognized at a national level with Swarnadeepa Award for promoting and showcasing Sri Lanka internationally and for the contribution he made for the country’s western music industry. Ricky has to his name on a 12 track CD `Alien Accent ‘released in Los Angeles out of which 10 tracks are voiced by him. His association with Imran Saibo has seen him performing at leading corporate functions locally and across many continents. “Imran Saibo of Fun Time, the island’s premier name in entertainment has been instrumental in my success. I have been able to reach the local and international music arena through him. I have also voiced over 400 jingles apart from performing at Colombo’s renowned hotels,” he said. Another aspect where Ricky and Legacy is sought after is for weddings. When you say `I do’ it is certainly the most important day in your life but for your invitees it is just another wedding, so it matters how you will keep them entertained throughout the celebration to make it a memorable day for them as well. “We are now gaining popularity as a wedding band. We plan the event meticulously with couples to understand the crowd attending. When performing I always interact with the gathering. So it is not just me singing and showing off my talents but the crowd is a part of what I do on stage. I see to that entertainment is executed with precision, professionalism and fun,” Ricky added. However Ricky laments that there is no recognition for the Western music industry in Sri Lanka. “Our country has young, talented musicians who have sprung out from nowhere. They have amazing talents and they need a platform to showcase what they can do. I think the government should support the western music industry more for these youngsters to reach the international arena and bring pride to the nation,” he said. “My advice for the young musicians, singers and entertainers is to be professional and strictly keep alcohol, cigarettes or any other substances out of your life. The absent of these unwanted substances in my life has contributed in a big way to become a successful musician and an entrepreneur,” he advised. Having had his training in interior designing, graphics and pre-press in Singapore, this old boy of St. Joseph’s College, Colombo is also the Managing Director of Ritzz Lifestyle International in Kohuwela, a fully-fledged interior design and furniture company that is dedicated in providing a personalized service to busy professionals. “We are a company that is constantly in touch with the international markets in Europe, USA, Australia, Dubai, Thailand, China and Turkey. Ritzz Lifestyles has direct access to global furniture and interior trends. Giving our residential, apartments and commercial property owners a world class design standards is the aim of our company. We transform living spaces providing a perfect combination of quality furniture and interior designs,” Ricky explained. “I would like to thank my God for all that he has blessed me with, my father Ishan Bahar, mother Dawn and brothers for the person who I am today. I cannot forget my wife who stood by me to date. She is an integral part of me and what I am doing. As the Director of my business she supports me amazingly with my two daughters Shyanne Bahar who is also a singer, song writer, composer and a Recording Engineer who is now training under veteran musician Ranga Dassanayaka and my youngest daughter who is aspiring to be a pilot. They have been my strength at all times. I also remember with gratitude Kirby and Fiona de Lanerolle, Trevor and Niomi Rajaratnam of Wow Church who are my spiritual parents,” he said. You can catch Ricky in action at the CURVE with his band Legacy. Ricky is thankful for hospitality conglomerate Harpo Gunawardane for the excellent partnership shared with him and his band Legacy. “You will see more of us at the massive valentine’s concert at Shangrila Hotel on February 14 as Ricky and Legacy is a part of the show. I will also be having a full blown concert celebrating my 30 years in western music industry in Sri Lanka,” Ricky hinted to his fans out there.